Travis Industries has begun to include a free moisture meter with each purchase of one of its wood stoves. Travis teamed up with the EPA’s Burn Wise program, which is promoting voluntary efforts like this to help wood stove owners burn cleaner and more efficiently. The Alliance for Green Heat applauds Travis' leadership on this and urges other manufacturers to start providing moisture meters with their new wood stoves. We'll do our best to publicize any manufacturer who joins this effort in our newsletters and on our website. For more information, you can also contact Larry Brockman at brockman.larry@epa.gov. "It's not a trade secret that you need properly dried and seasoned wood for any wood burning appliance to operate effectively. Your customers however may be in the dark about this small, yet crucial, detail. Since we want Travis Industries wood appliances to live up to your customer's performance standards we're now supplying a FREE moisture meter with every wood model! 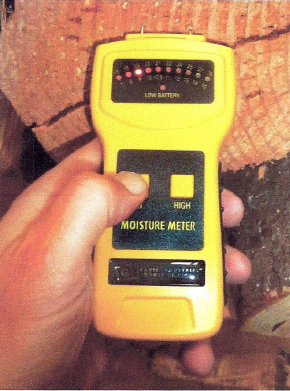 Also included is a "How to Use Your Moisture Meter" guide and handy educational sheet for the homeowner about the importance of wood moisture content. It's our hope that cultivating a broader understanding of wood preparation will eliminate unnecessary tech and service calls about the appliance." Click here for more independent, non-commercial consumer resources on choosing the right appliance and using it correctly. I hope more moisture meters manufacturers join this initiative. Moisture Meter-The moisture meter proves itself to be an excellent and extremely useful tool in any avid DIY enthusiast's tool box. The reason for this is often that moisture happens to be all around us country within the air and gift in many various materials. Being in a very position to be able to gauge wet levels in any given substance will pay nice dividends within the long-term in many another completely different DIY project.